The Informant - loved this movie. 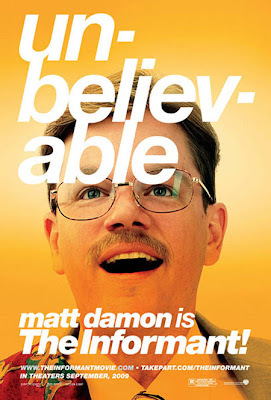 Matt Damon is fantastic as a nerdy corporate "spy". He is a total spaz and I enjoyed seeing him in this role.....quite unlike his others. True story. Lots of fun. Couples Retreat - had low expectations and even with that in mind, I left disappointed. It was choppy and didn't flow well....and at times, completely unbelievable. The girls were darling. Vince Vaughn (hush, Blake) and my new love, Jason Bateman, did not disappoint. 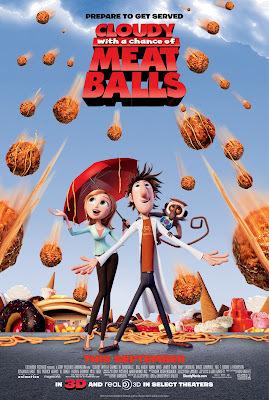 Cloudy With a Chance of Meatballs - very cute. I took Carter last week to see this one and I enjoyed listening to him giggle at it as much as I did the movie. "Gummy Bears!" is a non-stop laugh now in this house. Visual effects were fun and it had a good story behind it. Definitely one to take the kids to. Whip It - absolutely loved it. Drew Barrymore's directorial debut....I was so hoping she'd do well....and I'm happy to say it was a total hit. Ellen Page is possibly the cutest actress ever......every bit as lovable as she was in Juno.....can't get enough of her. It was set in Austin, so I enjoyed seeing our old spots....the Waterloo, for example. A whole lotta Texas pride in this movie, too, but not in the usual annoying way (sorry, girls!). Seriously, though....it was filled with lots of love for Austin and it made me proud to be a native Texan. Oh, and I loved it so much, I insist you watch the trailer. How cute is the Lollipop song? I'm obsessed with Drew Barrymore. Even though she's not in it. I'll have to check it out..
Dee - she is in it! And, hilarious.....you'll love it. Thanks for the tralier - I had not heard of that movie but now I want to see it! I love your moive reviews - I was trying to think of a moive to see this weekend and I think you might have helped that one out! THANKS! Took the girls to see Cloudy With a Chance of Meatballs last weekend. Loved it and we laughed the whole movie! Totally want to see Whip It! Glad to hear you liked it! I love Drew Barrymore so I'll check that one out. And can't wait to see Matt play such a different role. Saw Cloudy-cute! P.S. Have you seen Last House on the Left. Crazy thriller but it was actually well done. Steph - I wanted to see that one, but somehow it got away from me and is no longer at my theater! I'll have to rent it. Looked good!